Emerging artist Moonga Chiimba speaks at the Hall of Justice poster program launch on Jan. 18 while project co-ordinator John Caffery looks on. ‘I jumped at the chance [to participate],’ he said. A legendary American artist who died from HIV-related complications. A Toronto activist, author and spokesperson for trans people of colour. A scientist working with the Centre for Addiction and Mental Health who specializes in queer youth homelessness. An out gay actor everyone knows as Sulu from Star Trek. What do these people have in common? They are all featured in Hall of Justice, a new poster campaign celebrating LGBTQ heroes and activists. On the night of Jan. 18, while television cameras swarmed Toronto's Church-Wellesley Gay Village looking for reactions to the news that police had arrested Bruce McArthur and charged him with the murders of two missing gay men, another event was taking place at the Church Street arts hub Glad Day Bookshop. It was a far more positive yet no less timely event: the launch of Hall of Justice, a series of posters designed by queer youth to celebrate LGBTQ heroes and activists. Created under the auspices of Supporting Our Youth (SOY) and the Sherbourne Health Centre, with funding provided by Community One Foundation, the posters will gradually spread out from the traditional neighbourhood of Toronto's LGBTQ community to urban and rural community centres, shelters, libraries and schools. The goal is simple – to create dialogue about the long history of queer activism and from that dialogue inspire younger people from the LGBTQ community to find their own voices. Project co-ordinator John Caffery, a former SOY mentor, notes that during his years working with emerging LGBTQ artists, there was a palpable "thirst for information about elders … Hall of Justice is designed as a collaboration that will create shareable resources to engage youth in social change and work on creative responses to oppression." 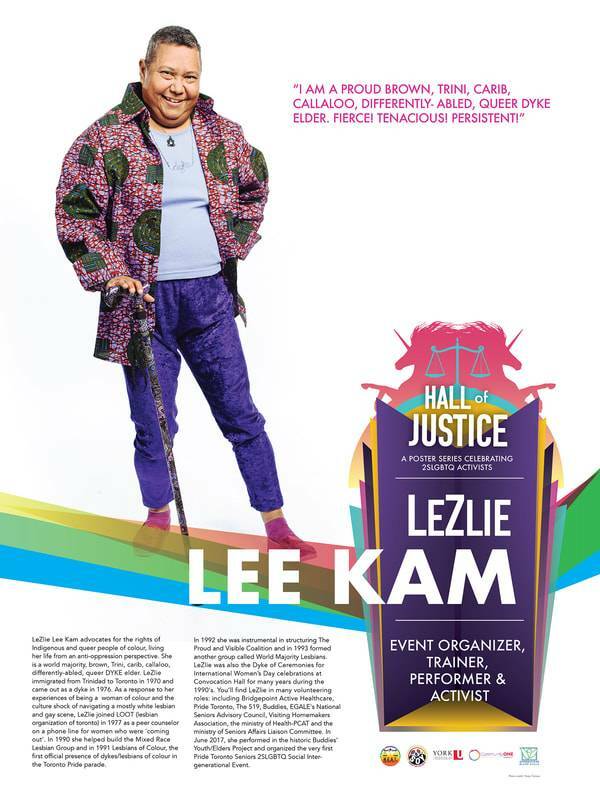 Lesbian activist and teacher LeZlie Lee Kam. Activists and heroes profiled include lesbian activist and teacher LeZlie Lee Kam, anti-apartheid and AIDS activist Simon Nkoli, beloved poet and essayist bell hooks and queer youth advocate Alex Abramovich – a varied group united by their decision to speak up for people who are traditionally denied access to public spaces and discourses. 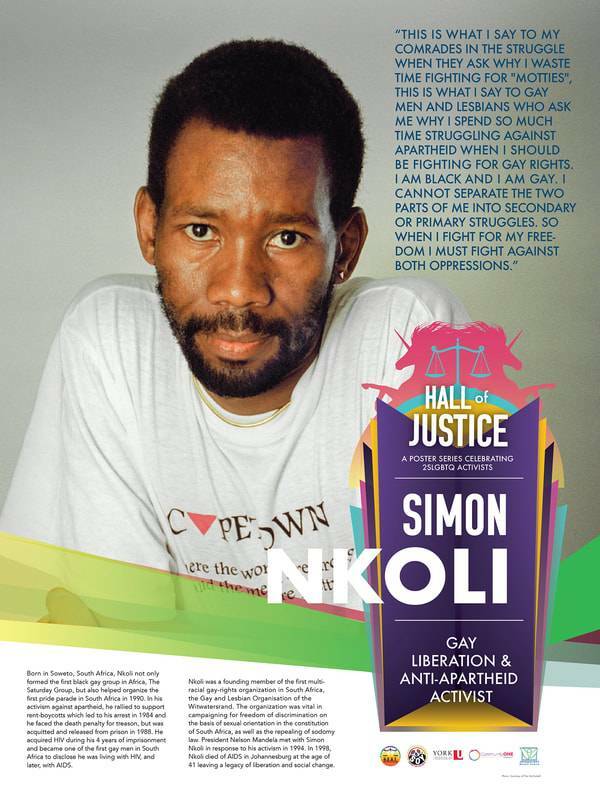 Anti-apartheid and AIDS activist Simon Nkoli. Mr. Caffery describes the selection process, wherein hundreds of potential subjects for posters were gradually winnowed down to 11, as a long bout of "listing and prioritizing." The young artists and Mr. Caffery sat in a room and "wallpapered" with photos and texts. "I created approximately 100 profiles. There was a lot to sort through and absorb. We used a process of 'dot-mocracy' wherein each of us had 15 stickers to vote with." 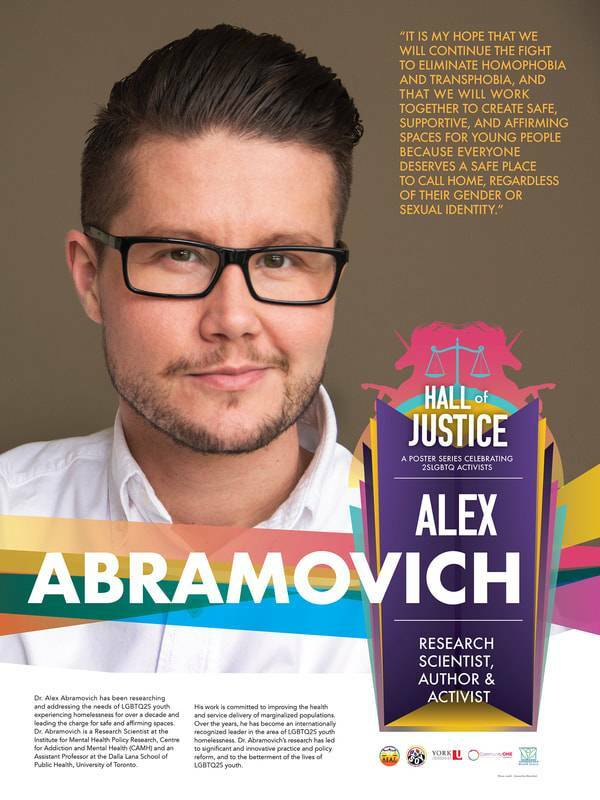 Queer youth advocate Alex Abramovich. By the time the final 11 were chosen, Mr. Caffery says, "the youth expressed how deeply they felt about the inclusion of activists as they related to their own struggles and identities." In sync with the "dot-mocracy" process, the final works, humble (and fragile) paper posters, are arguably one of the world's oldest and most reliably egalitarian art forms. Unsubtle and immediate information-spreading tools, all posters need is a wall and some tape. 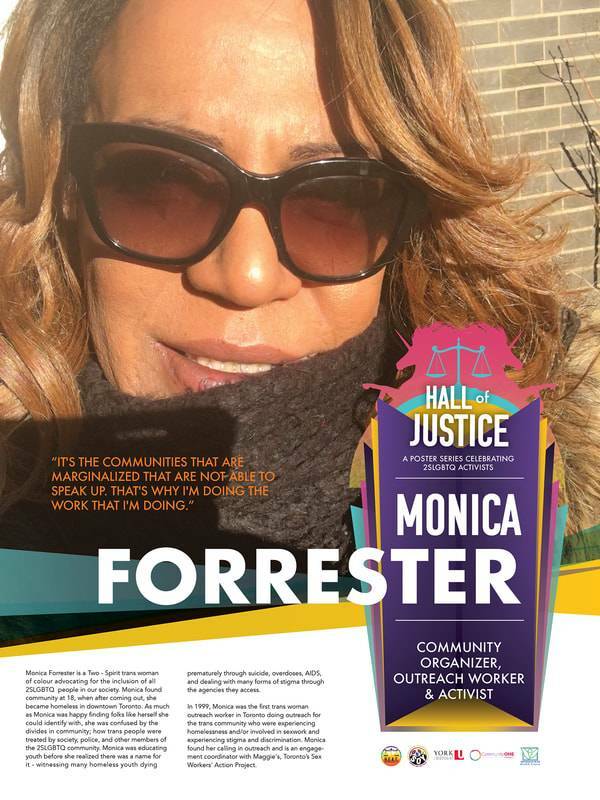 Community outreach worker and activist Monica Forrester. Moonga Chiimba, one of the emerging-artist contributors, notes that as Hall of Justice posters spread across town, "queer people, and in particular young and racialized queer people, will get the chance to see people wholly like them being celebrated and revered." For Mr. Chiimba, the project resonates with his own story of coming to Canada and finding a new voice. "I arrived in Canada as an immigrant," Mr. Chiimba says, and "was looking to find connection to a greater story, because my life has been gravely affected by structural limitations placed on me by my queer identity. "I jumped at the chance [to participate in the project] because I had been coming to a greater appreciation in my own life of the importance of real rootedness in the place that I had chosen to live." The collective process of choosing heroes and designing the posters reflected the larger concern the group felt, Mr. Chiimba notes, to "emphasize [activists whose work] had been comprehensive … work that considered or took into account in a very real way the marginalized members of our community." Mr. Chiimba knows just how "very real" marginalization can be. He cannot return to his country of origin without fear of persecution or violence. But the last thing he wants to do is hide. Like Hall of Justice, Mr. Chiimba values the stories of those "who had come before me and who tried to make it so that others might live better and with more dignity." Over the coming weeks, Hall of Justice posters will be on view at York University, Central Toronto Academy, Sherbourne Health Centre and Glad Day Bookshop.